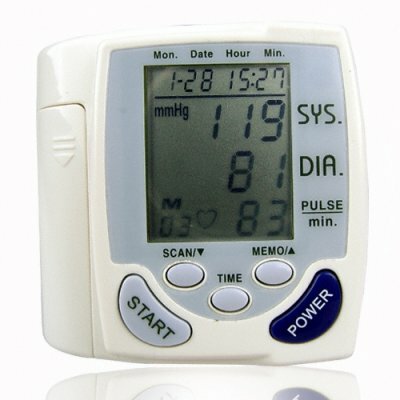 Successfully Added Blood Pressure Monitor - Fully Automatic to your Shopping Cart. Blood Pressure Monitor - Fully Automatic. New health care blood pressure monitor for taking your blood pressure at anytime with the greatest of ease. Simply attach the wrist cuff, start the test, and your systolic and diastolic pressure as well as your pulse rate per minute will be displayed on the large LCD display. This health gadget also features a date and time display, memory for storing up to 30 previous tests that will also display the time and date it was taken, and easy and long lasting power from only 2 AA batteries. A great new item for making sure that you are healthy and fit, direct from China to your door. Good quality product. Does exactly what it is supposed to do. Very easy and cost effective way to get an accurate reading of your blood pressure taken over time.